It is a 20-minute car ride from the popular Glenary’s cafe in Darjeeling to downhill Patlaybas. Here, at one of the narrow bends near Patlaybas, there is an unexpected traffic jam. A man in a white T-shirt, track pants and heavy boots paces up and down the road, tailed by a group of youths taking instructions. Men and women stream in, some bend to touch his feet. With that, the hills of Darjeeling are back in turmoil like they were in 2007, when Gurung had renewed the call for a separate state, breaking away from once mighty Gorkha National Liberation Front (GNLF) led by Subhas Ghising. Bimal Gurung had then snatched the baton and, with it, power over the hills from Ghising, who had been the first to demand a separate state of Gorkhaland. Today, like in 2007, columns of Army and CRPF march on in different parts of the hills and hundreds of policemen guard government offices and establishments that the GJM have forced shut. On Thursday, after police raided his residence and party office in Patlaybas, GJM supporters clashed with police, setting ablaze a police outpost, a sericulture office and a railway station. The GJM called for an indefinite bandh and, as the agitation spread, police lathicharged and teargassed protesters. “Change” has indeed come to the Gorkha Janmukti Morcha and its 52-year-old chief. Gurung hailed from a poor family — his mother used to pick tea leaves in one of the gardens here and he had dropped out of school. He joined politics as a teenager and rose through the ranks under Subhas Ghising, who, in the 1980s, set up the GNLF that launched a violent agitation for a separate state. Over 1,200 people are said to have died during the agitation between 1986 and 1988 and the Left Front government that ruled the state branded the agitation as a separatist movement. After talks with both the Centre and the state government, in 1998, the Darjeeling Gorkha Hill Council — an autonomous governing body with control over civic issues, among others — was set up, with Ghising as its chairperson. Peace returned to the hills once again. Gurung, a popular leader of the Patlaybas area, was elected councillor. Though he had made his mark as a politician, Gurung’s meteoric rise is often attributed to Indian Idol, a popular singing reality show on Sony Entertainment Television. That year, in 2007, Prashant Tamang, a 24-year-old constable from Darjeeling, had made it to the finals and Gurung, riding on ‘Gorkha pride’, managed to whip up hysteria in the hills. Eventually, Tamang won the third edition of the contest with crores of audience votes. “People came in hundreds to listen to Gurung, who spoke about supporting Prashant Tamang and collected funds for the singer. When Prashant won, a lot of the credit, at least in the hills, went to Gurung, who had become a mass leader by then. He even overshadowed the ageing Subhas Ghising,” says a senior GJM leader. His speeches gradually turned from Tamang to how the state government and Ghising were not doing enough for a separate state. In 2007, after a public fallout with Ghising, Gurung set up GJM and launched a violent agitation over Gorkhaland that saw people setting fire to government offices and bungalows. He called a series of bandhs, one of which lasted 40 days, during which people were asked not to pay their bills and revenue to the government. Overnight, he became the leader of the people of the hills. In 2011, Mamata Banerjee came to power in Bengal, riding the Parivartan (change) wave and ending 34 years of Left rule. She was quick to take the GJM on board. On July 18, 2011, the Centre, the state government and the GJM signed a tripartite agreement, leading to the setting up of the Gorkhaland Territorial Administration (GTA). Unlike the earlier Council which had control over 19 subjects, the GTA was vested with powers to regulate 59 departments, including education and agriculture. In the GTA polls of 2012, GJM won all 45 seats and Gurung became chief executive. But the good run came to an end as the Trinamool began to expand its base in the hills. Instead of routing development funds through the GTA, the government allegedly began to disburse it through the district magistrate. Besides, the recent local polls saw the Trinamool winning from the Mirik municipal body in Darjeeling. For the first time, a party of the plains had made its mark in the hills and Gurung wasn’t going to take it lying down. “We were fooled by the state government when we signed the GTA deal. Nearly 50 departments were to come under GTA but only three or four came. Nearly five years have passed and nothing happened. We were not allowed to work and GTA is a sham,” says Gurung. “The government suddenly imposes Bengali on us, making it mandatory in schools. What about our mother tongue, Nepali? We have asked the state government to clear its position on the language issue,” says Roshan Giri, general secretary of GJM. On June 8, as Chief Minister Banerjee held a special Cabinet meeting at Raj Bhavan in Darjeeling, the protests turned violent, with GJM supporters pelting stones and setting fire to a dozen government vehicles and police reacting by lathi charging the crowd and lobbing teargas shells. On June 10, as the state government ordered a special audit of the funds received by GTA over the last three financial years, Gurung responded with a fresh call for Gorkhaland. Once again, the battlelines were drawn. “It was in 1907 that the Hillmen’s Association was formed and letters were submitted to the British for a separate state. We have a distinct identity. Our language, food and clothes are different. Why can’t we ask for a separate state? Imagine the development that will take place in these areas if we were a separate state,” says Swaraj Thapa, GJM central committee member. Party colleagues and political observers say this is a Gurung “very different” from the young, temperamental leader of 2007. This time round, they say, he is “more mature”, armed with a strategy that’s markedly different from that of 2007. “In 2007, there was little communication with other political leaders. But now, we are placing our case before all parties and MPs, telling them that all we want is a separate state. We have been reaching out to Shiv Sena, BSP, SP and others. Our leader Bimal Gurung has been in politics for decades. It is the media which paints us as violent agitators; we have been placing our demands in a democratic way,” says Thapa, the GJM central committee member. Gurung has also kept the BJP central leadership and Union ministers in the loop on the situation in the Hills. An ally of the BJP since 2007, Gurung was instrumental in the victory of BJP MPs from the Hills, including Jaswant Singh in 2009 and S S Ahluwalia, Union minister of state for agriculture, in 2014. The party also sent a delegation led by Giri to meet Rajnath Singh and Gurung has written letters to Prime Minister Narendra Modi and Rajnath Singh. As the agitation picked pace, Gurung also roped in Gorkha outfits in the hills, including his once sworn enemy, GNLF, which called off its alliance with the ruling Trinamool Congress. GNLF was in an alliance with Trinamool in the last Lok Sabha and Assembly polls, apart from the recent civic polls. The move to unify all Gorkha parties — along with Gurung’s admission that he is ready for a “collective leadership” of the movement, knowing fully well that the GJM enjoys supremacy in the hills — is seen as a tactical one. “It was Subhas Ghising who raised the slogan of Gorkhaland in the 80s. Though we have differences with GJM, we are united for a separate state,” says Mahendra Chetri, general secretary of GNLF. “We are not serious about our alliance with Trinamool Congress if they are not serious about our demand,” he adds. As he prepares for a prolonged agitation, a cautious Gurung is consolidating his position in the Hills, reviving GJM’s defunct organisations such as the Gorkhaland Personnel and its youth and women’s wings. Unlike in 2007, GJM now has women at the forefront of its agitation, with members of its Nari Morcha (women’s wing) turning out in big numbers. Over the past three days, hundreds of Trinamool Congress workers in Darjeeling have joined the GJM. “We welcomed her in Darjeeling. But she tried to divide us by making separate Boards for Lepchas and other communities for the sake of political mileage and to undermine us. Now after the Gorkhaland call, everyone is coming back to us. We will fight this battle together,” says Gurung. His critics, however, say that if Gurung is a different, more reasonable man now, it’s not without reason. Almost all the top leaders of his party have FIRs against their names in various cases, many of them under non-bailable sections. This, they say, has forced his hand. 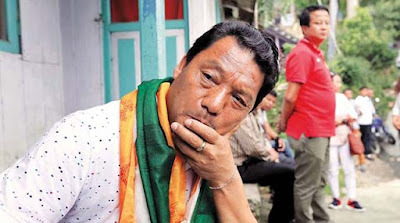 Gurung; his wife Asha, a central committee member and head of the Nari Morcha; general secretary Giri; and assistant general secretary Binay Tamang have all been booked for the 2010 murder of Madan Tamang. Madan, head of the All India Gorkha League, a GJM rival, was murdered in broad daylight near Planters Club in Darjeeling. The CBI has filed a chargesheet and Gurung and the others are on anticipatory bail. Trial in the case is set to start soon in a Kolkata court. “I dare them to arrest me. I was not involved (in the murder). Miscreants backed by the Trinamool started the trouble. I am ready to go to jail and then, somebody else will take charge of the party. But the government will be responsible for the violence that will follow in the Hills. Let them arrest me and you will see what happens,” says Gurung. Even his critics, many of them leaders of other Gorkha parties, grudgingly admit that Gurung is the rallying point for the present agitation. However, as Chetri of GNLF clarifies, they are “only with the cause, not the man”. “After he rose to power, Gurung made our workers and leaders suffer through threats, social boycott, arson and even force. We will support the cause only if it is done under a collective leadership. If he tries to take the lead, we will agitate separately,” says Chetri. Back in Kolkata, Banerjee has already made it clear that she will not allow the “division of Bengal”. “Some goons tried to threaten me and stop me from going to the Hills. I went there and I will go there again. The people of the Hills are not with the goons,” Banerjee has been saying in various rallies since her Darjeeling visit. Asha Gurung: Wife of Bimal Gurung and head of the Nari Morcha, the party’s women wing. The almost defunct outfit has now got a new lease of life, with women out in full force in rallies across the hills. Bimal Gurung, the undisputed mass leader of the Gorkhas - It is a 20-minute car ride from the popular Glenary’s cafe in Darjeeling to downhill Patlaybas. Here, at one of the narrow bends near Patlaybas, there is an unexpected traffic jam. A man in a white T-shirt, track pants and heavy boots paces up and down the road, tailed by a group of youths taking instructions. Men and women stream in, some bend to touch his feet.